Thank you for creating Skinnygirl! Sincerely, Me. 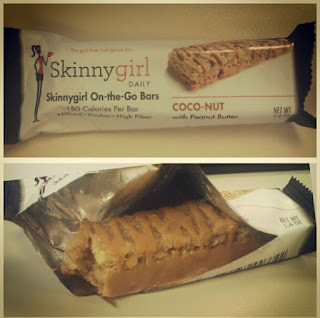 But on a serious note, I was recently given the opportunity to try out this Skinnygirl daily on the go bar. I was so excited to see this product in my sweet heart vox box from influenster as I am a big fan of Skinnygirl Margarita's, however I was a little disappointed when I saw the flavor. Coco-nut... Coco-nut.... I hate coconut... But Ms. Frankel wouldn't steer me wrong would she?! No she definitely wouldn't. I decided to try the bar and I was in love immediately. The coconut flavor was mild enough and mixed with peanut butter it was SO DELICIOUS! I went straight online to http://www.skinnygirldaily.com/ to see how I could order more! I am so in love with these bars, the only down side for me was the price. Being a one income family these are a little pricey but if you think of it as a meal replacement it's not as bad. I would definitely recommend trying these out for anyone who has a sweet tooth but is still trying to stay healthy! They also have Banana Oatmeal Dark Chocolate, Dark Chocolate Multi Grain Pretzel and Greek Yogurt Blueberry crisp flavors! Yum Yum Yum!